I am trying to help my mom out. I’m feeling overwhelmed and confused. I find that I sometimes snap at her and then I feel guilty. What do I do? Mom insists she is safe living alone. She has had two falls and we are just waiting for the call to tell us she is in the hospital with a broken hip. We don’t want to force her to make a change, but she is at risk. Dad goes to four different doctors and they do not speak to each other. We have the internet but that does not make us experts. No one will take time to speak to us or answer out questions. Where do we turn? My dad needs to stop driving, but he will not talk to us about it. The car has lots of dents. He can hardly get in and out of the car after his stroke. We are so concerned about his safety and the safety of others on the road. We live out of state. We get calls from the neighbors about our parents. When we call them we hear that everything is fine. How do we handle this without moving near them? Our parents live in Florida on a permanent basis and have for more than 10 years. We recognize that they are not safe living that far from us, but they refuse to move. Now what? Our mom is in an assisted living facility. We are not sure that they are doing a good job and are considering a nursing home instead. How do we assess them and her to know whether a change is necessary? Mom is failing, but still alert and oriented. We do not know what she wants if she is unable to make her own decisions. We don’t even know where she wants to be buried or if she wants to be cremated. We are all afraid to talk to her about this. We have an agency that provides staff that are living with our parent. The staff used to come a few hours a day, but we felt for their safety needed to have assistance 24/7. We are even wondering if this is enough. Is that the kind of service you provide? I have three brothers and sisters and none of them participate in taking care of our mom. They live in within miles of our parent’s home, but all of the caregiving falls to me. I cannot do it anymore. Why won’t they help me? To find what you seek in the road of life, the best proverb of all is that which says: "Leave no stone unturned." Try not to become a man of success but a man of value. Do we not all agree to call rapid thought and noble impulse by the name of inspiration? Falls are a leading cause of injury and death in the senior population. There are many sources of information on the outcome and consequences of a fall for the elderly. Some of the statistics include these from the Centers for Disease Control and Prevention (CDC) www.cdc.gov. One of every three adults over the age of 65 fall annually. Falls are not the exclusive purview of nursing homes or assisted living facilities. They happen to community living seniors nearly as frequently because the lack of awareness. There are some smart things that you can do if you are in the at risk group. Fall problems are divided into two general categories those being intrinsic and extrinsic factors. Intrinsic factors include things that part of your make up. Extrinsic factors are external to you. You can start taking control of the extrinsic factors by doing a safety assessment of the environment where you live. The following is a partial list of some of the intrinsic factors and their related risk. 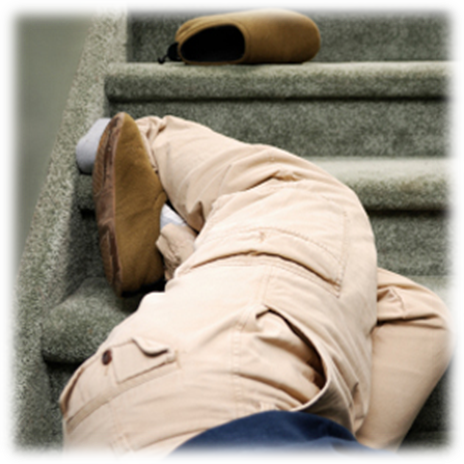 Extrinsic factors are things in your environment that can lead to falls. These are in your home, the home of friends and neighbors and in public places like malls, churches and restaurants. Falls are not a part of aging. While seniors have more falls, they can be prevented by using common sense approaches to enhance safety. The first rule is, if it seems unsafe, do not do it! While it is difficult for many of us to ask for assistance because our life long independence, that pride of independence can be deadly for a senior. Recognize fall risks prospectively. In discussion with seniors after the fall and injury, many will state that they knew that the action was unsafe, but they did it anyway. Do not take chances that are unnecessary. It is difficult to ask for help and admit that you can do everything yourself, but every stage of your life required some changes and aging is no different. When a senior falls they have adverse consequences that are devastating. Research by Coogler provides the following statistics for seniors and falls. One fourth of elderly persons who sustain a hip fracture die within 6 months of the injury. More than 50% of older patients who survive hip fracture are discharged to a nursing home and nearly half of these patients are still in the nursing home a year later. Hip fracture survivors experience 10 to 15 percent decrease in life expectancy and a meaningful decline in overall quality of life. If you sustain a fall and are having pain, do not ignore it. Delaying diagnosis and treatment can lead to worsening consequences. Know the symptoms of a fracture. The classic signs and symptoms of a hip fracture are that the injured leg is shorter and it rotates externally or turns outward. With a hip fracture you may still be able to walk, but feel pain in the buttock, knee, thigh, groin or back. Signs and symptoms of any fracture include some of the following: pain at the site of the injury, pain adjacent to the site or referred pain, limitation of use of the limb or bruising at the site. One of the most important fall prevention strategies for people of any age is exercise. Walking at least 15 minutes a day has been shown to make a positive impact on fall risk. Lifting weights is also excellent strengthening muscles and bones. Other types of activities exercise that have been shown to benefit seniors at risk for calls is yoga and tai chi. Anything you do to keep your muscles strong, your joints flexible and that stresses your heart a bit is healthy for you. If you have not exercised in the past, do not start any exercise program without checking with your healthcare provider first. DISCLAIMER: The content of this website is provided for general informational purposes only and is not intended as, nor should it be considered a substitute for, professional medical advice. The use of the information on this website is not intended to diagnose or treat any medical or health condition. If you or a family member suspect you have a medical problem, promptly contact your professional healthcare provider. Charism makes no warranties of any kind regarding, but not limited to, the accuracy, completeness, timeliness or reliability of this website's content.